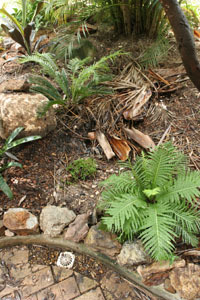 A french drain using on-site soil-building palm fronds, salvaged drain pipe, and left-over gravel, dug with hand tools, infiltrates rainfall to passively irrigate the garden. All You Can Eat Gardens is committed to reducing our impact on the environment and restoring soils, oceans, habitat and vegetation. By bringing food production into the wasted spaces in our backyards, we seek to limit farming, transport and processing activity that encroaches on, pollutes and damages other species and wild ecosystems. Biodiversity is of central concern to the permaculture design system. In our designs, where possible, we seek to create habitat for wild animals and space for wild and unmanaged plants to exist, which compete with or predate upon unfriendly species. When necessary we use organic, low impact deterrants and treatments to limit pest damage. We use natural, on-site, salvaged, second-hand, second quality and sustainably sourced materials where possible. Offcuts and left-overs are used where possible, and the remainder composted or disposed by council waste systems. While, we do not have a formal carbon offset scheme in place, we believe our efforts over the long term approach or exceed neutrality. We are seeking to research, develop, promote and source our power and fuel, food and fibre from renewable, sustainable and carbon negative sources - taking carbon dioxide out of the air.